Over the last couple of days, I learned how to edit web streams to ds106radio, and how to track down the right URLs for those streams. A little background: for several weeks I have been programming in the daily playlists, a little bit at a time. I know others are doing this also. It is a task that is needed to minimize the possibility of dead air. Sometimes I take the lazy easy way out and program in a web stream instead of individual songs. Eight hours done with one easy click and drag! But, I hadn’t been checking to see if the streams really worked. Tuesday, I think it was, I noticed a tweet or two concerning the ds106radio feed seemed to have something wrong with it. I looked, and sure enough it was meant to be playing a stream from WITH radio, but was dead air. I fumbled around and learned that if I delete the stream from the program, I can’t just slide new items into the empty space. The stream had two more hours left, and that was going to be dead air. But, I discovere that I could create a new stream specifically for that empty time frame, so filled in with WFMU. Once the two hours expired, normal programming resumed. Well, there was an additional confusion factor: the Airtime program we use for managing ds106radio had updated to a new version. A few other folks, like Alan Levine, Grant Potter, and @TheFocusZone were busy fixing links for such things as the listen buttons. Gotta have working listen buttons, or what’s a radio for? OK, next step for me. When I had the chance I checked the streams for the various radio stations we have in the ds106radio library. Within Airtime, there is the capability to preview and listen to any of the streams or files in the library. It turned out that more of them didn’t play. As I investigated, I found that the stations themselves had changed their sources, so it seemed all I would have to do is update the URLs of the streams. But it is not that easy. Most of the streams that we use are listed on the radio stations’ pages with file extensions of .m3u or .pls. These are actually text files that are used by media player programs to then open up the actual stream. I needed the actual stream URL. I had to download the files and open them in Notepad, and then extract the actual stream URL. Sometimes this worked, sometimes it didn’t. End result: All but two of the streams already programmed now work. One of the two that didn’t work, the station’s webpage stated that they had a bad stream server (and didn’t indicate it was being taken care of). 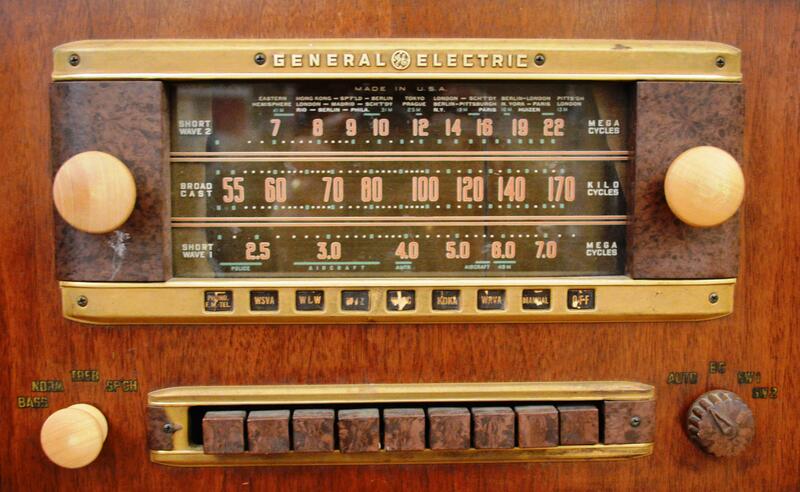 The other one was not a radio station, but an individual streaming old time radio. Unfortunately, the URL of his stream did not function in ds106radio. So, I deleted those two streams from the library to avoid scheduling them and ending up with dead air again. In the process, I discovered quite a few radio streaming sources that I will benefit from myself. 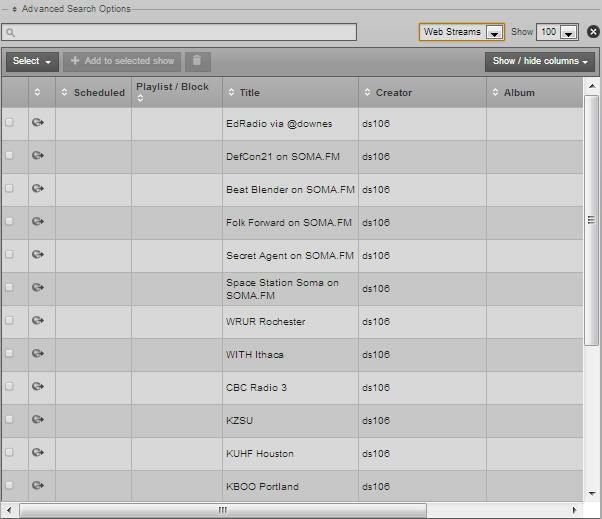 For example, we have five different streams from SOMA FM. They actually provide many more, playing various genres. Maybe I’ll program in all of them (someday) for more choices. So much to listen to, so little time. Wow! Two days of fun on a university campus. Who knew that could happen? I came to this event, designed and sponsored by and for state university/college folks, as a kind of insider/outsider. The outsider is because I teach at a for-profit university. The insider is because I have known several of the organizers/speakers through ds106. 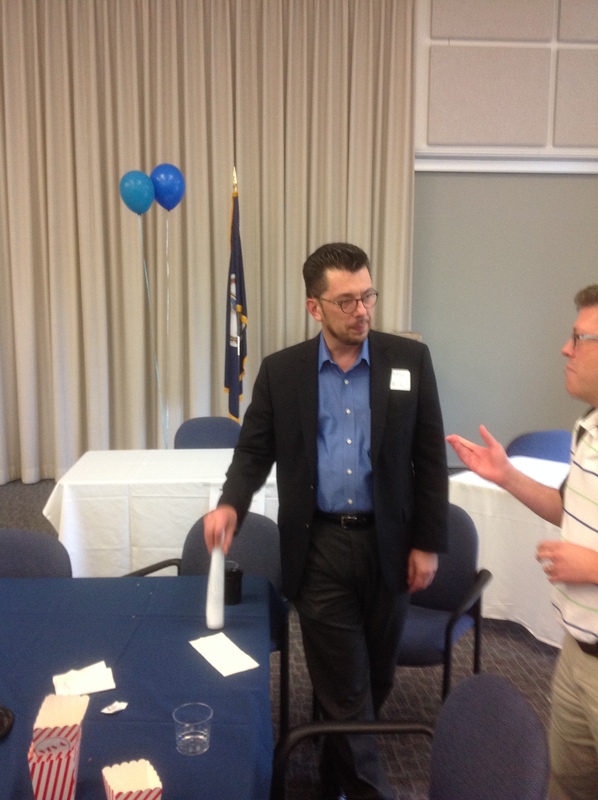 I was glad to be a part of the event, and have quite a bit to take back to my own practice and to share with others. I’ll summarize the high points by listing many of the bullets and phrases that ended up in my notebook as I attended the sessions Tuesday. Forgive me if they are misquoted or misattributed; such is the nature of open student/teacher life. A big house with lots of rooms. School is a technology that facilitates learning. System 2: hmmmm. Thinking slow. To stimulate system 2, ask a hard question about a complex matter. Metaphors are keys to making your system 2 work. Wicked problems, extremely complex, perhaps unsolvable. And there are a lot of other notes, people, writings, etc noted down to look up later, that came up in conversations. And that is the approximate total of my note-taking! Not even anything from Minding the Future. But there was so much more! The ruminating is beginning. Now the fun times, the personal times, the personal fun times: ds106 people everywhere! If I was an outsider, at least I was in my home state. 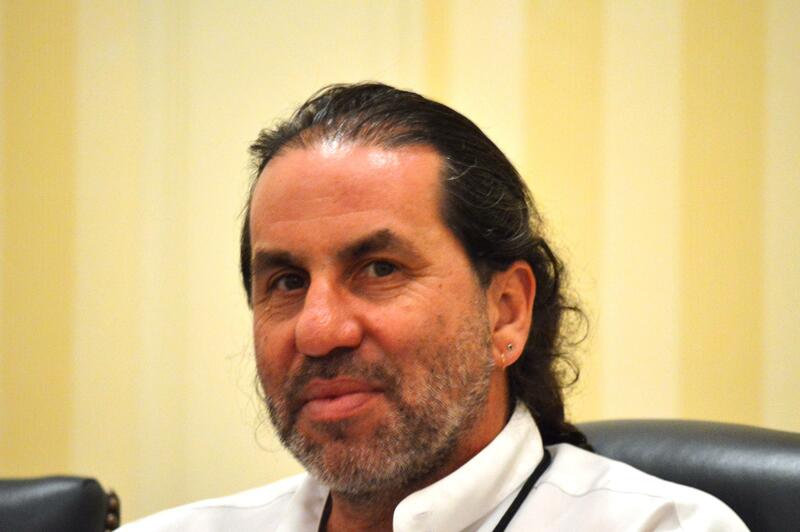 But Scott Lockman (@scottlo) came from the Kingdom of Saudi Arabia. Andrew Forgrave (@aforgrave) came from Ontario, Canada. 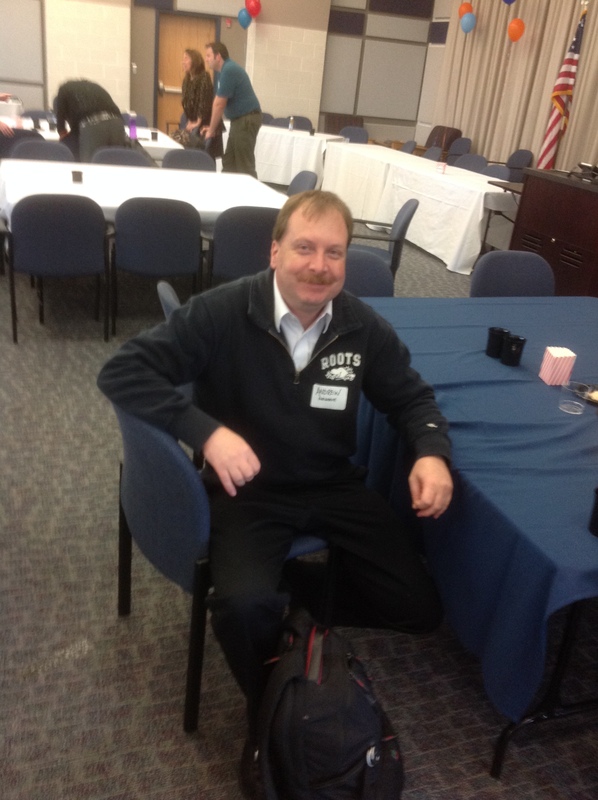 Paul Bond (@phb256) came from Pennsylvania. The speakers came from out-of-state, too, but think of Alan Levine (@cogdog) stopping off here between Alaska and Puerto Rico. 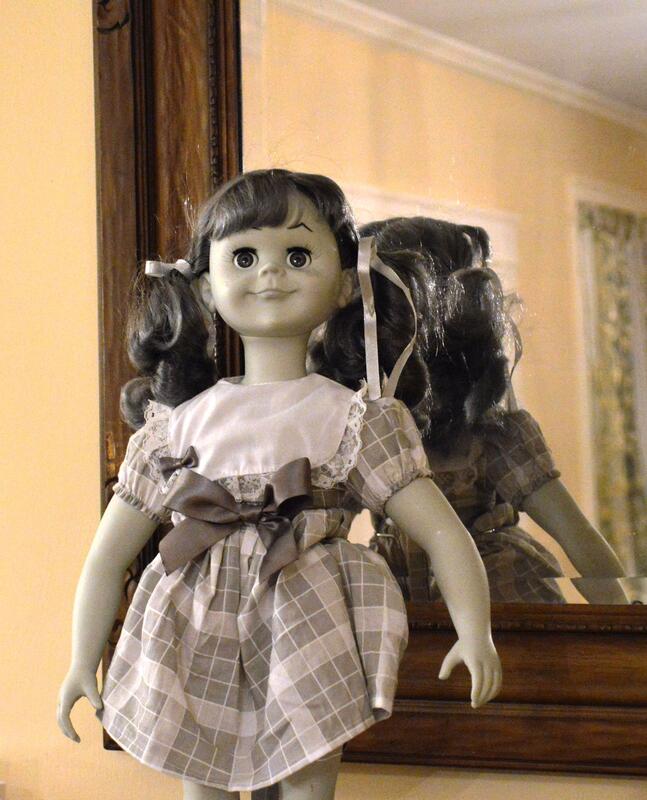 And Talky Tina (@IAmTalkyTina) came in from who-knows-where, I think stowed away on an interstate truck. Tom Woodward (@twoodwar) came from elsewhere in Virginia. As did Melanie Barker (@indieschoollib). There were others that seemed somehow involved in ds106, but I can’t be expected to remember everyone… I learned that no one looks like their Twitter avatar. 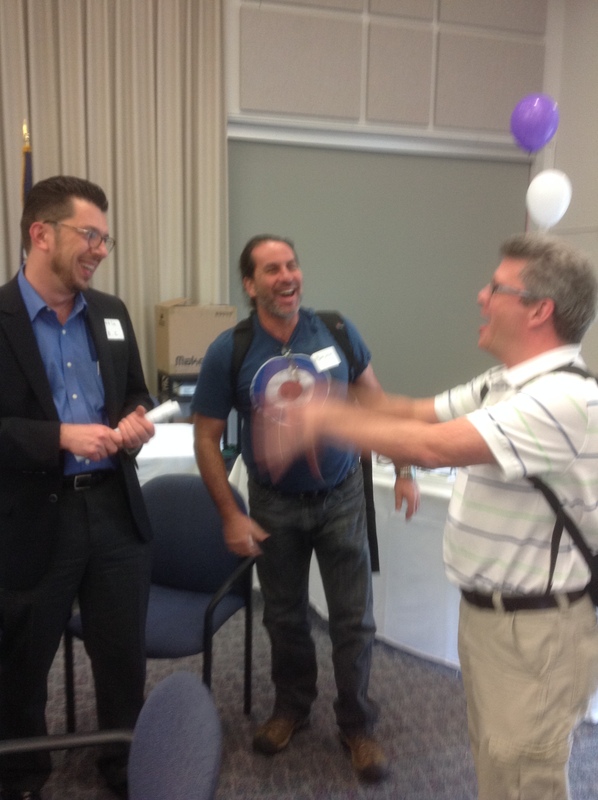 As visitors and not organizers or presenters, Andrew, Scott, and I enjoyed some time together. You guys have my respect for all you do, and instant friendship for who you are. And your respective work is inspirational to me. God bless you both. With ds106, how can I not also think of everyone at UMW’s DTLT and associated folks: Jim Groom, Martha Burtis, Tim Owens, Ryan Brazell, Andy Rush, Robin Smail. Visiting them in the makerspace was fine, but I missed seeing the ds106tv couch and green screen. In the world of ds106radio, I was glad to have dinner alone with Scottlo, after Andy Forgrave found the wrong restaurant. Many upcoming project possibilities, so stay tuned to his frequency. And we shared a bit of our lives. He inspires me to up the ante on my own future possibilities. I wanted to spend more time with Alan, but that will happen in the future. No doubt. And last but not least, a shout of thanks to Jim Groom for his encouragement and open-handed generosity. It was nice to see your workplace, nicer to see your home, even nicer to meet your family. Peace, Bro. One of the fun things I like to do is visit yardsales and thriftshops. Not only is if fun to look at the odd miscellany that other people no longer want, but it fills practical needs. Sometimes, I’ll find clothing to wear. Occasionally, there will be some tool or gadget or supply that we can use around the house. Most often, however, I am looking for books! Books have been a multifaceted hobby since childhood. Reading, collecting, selling, trading, giving, cutting up and using the pieces, and just plain filing shelves and stacking up all over. Over the last two weekends, I’ve purchased the following books. Though I visited a couple of yardsales, these came from two booksales held by local churches and from a thrift shop. 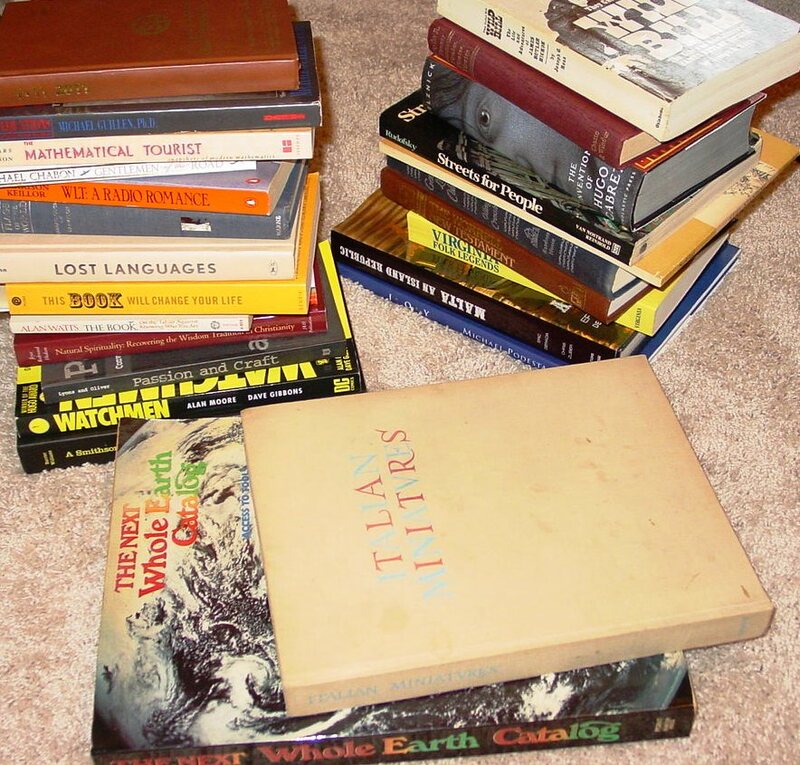 Of these books, I’ll read or at least skim, all of them, but most are destined for either eBay sales, PaperBackSwap trade, or re-donate to the thrift shop. A few will linger on my shelves for actual reading. Two or three will be used for scrapbook fodder. As you can see, this is either a lot of reading to do, or I need to get busy and sell them! After fourteen years of consistent eBay bookselling, I’ve taken a break for about five months now. It is time to “turn to” as they say. For today’s daily create, tdc643, we are asked to draw the internet. I’m not sure I can fit in the entire collection of routers, servers, cables, radios, wires, fiber optics, data centers, hosting services, and everything else that make up the internet. 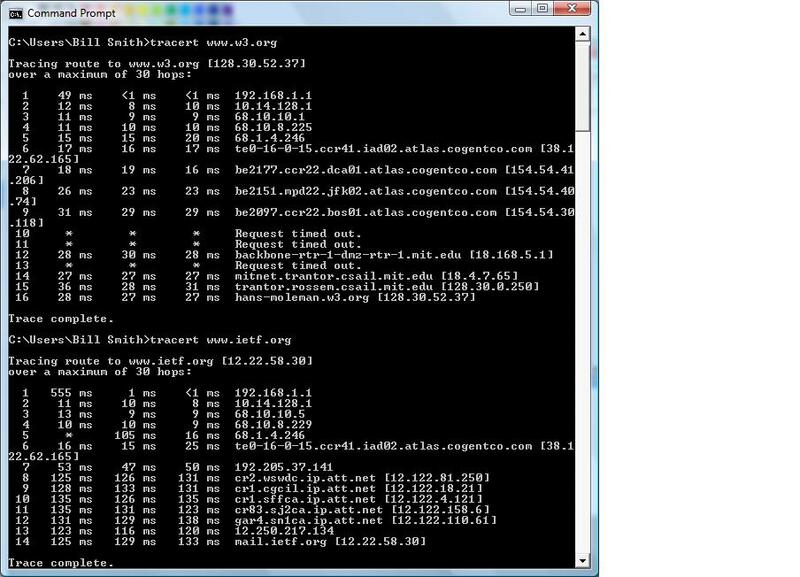 So, I’ve focused in on two parts by performing a tracert (trace route) command and seeing the path taken from my laptop at home to the two organizations that provide the most oversight over what we call the internet. First is the World Wide Web Consortium, responsible for the structure and use of the URLs (Uniform Resource Locators) that we use to find the computers on the internet. Of course, there is more to it than that. Second is the Internet Engineering Task Force, overseeing such things as the various numbers and addresses used to navigate through the internet, and many of the protocols and structures that make things work. 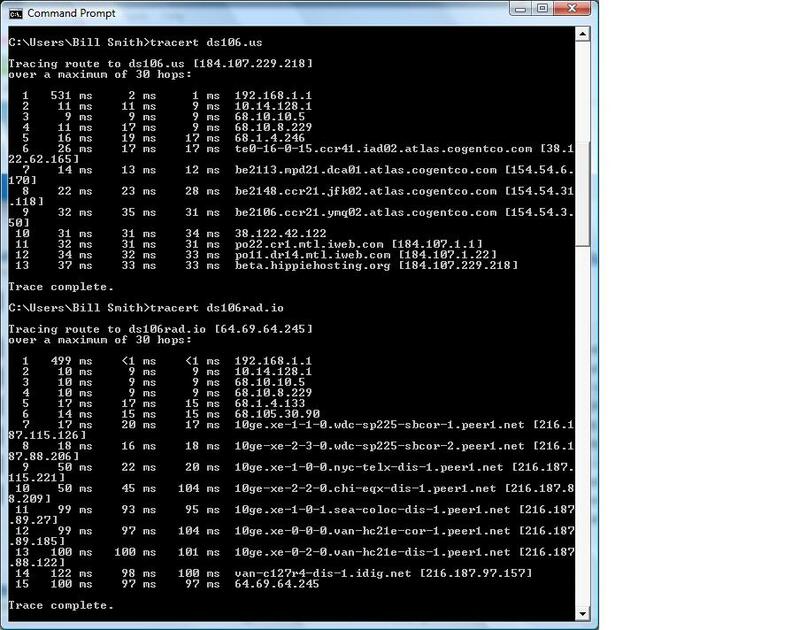 In furthering my research and understanding of the structure of the internet, I did two more tracert commands, to find out where the servers for ds106.us and ds106rad.io are located. It might not surprise you to know that ds106.us ends at hippiehosting, and is actually in Montreal. I was only slightly surprised to find ds106rad.io hosted at a server in Vancouver, British Columbia. In Daily Create TDC635, Stefanie suggests “Cry, die, then fly … take a picture that expresses emerging from a crisis.” I didn’t take a picture, but I took an old picture, a drawing from The CoEvolution Quarterly of Summer 1974. The theme of emerging from a crisis is expressed as harnessing the inevitable, making the most of the circumstances, rising above the crowd. The image was a black and white, almost full-page drawing. I used GIMP and scaled it down a bit, added the color to highlight the brick and the blue sky with the fill tool, duplicated for a total of five layers. I slightly moved the second and fourth layer, then fit the canvas to the layer to make a uniform size. Then exported as a gif, with animation speed of 50 ms between frames. I think the effect is nice, implying the panic of a super-tsunami coming into the city, and the surfer harnessing the inevitable. Today’s Daily Create asked for video looking closely at the food I eat. I intended to make a nice one about dinner, starting with the well-plated plate. But I forgot! Halfway through desert it occured to me I could still make a quick video. I grabbed my iPad, and had to figure out changes that iOS7 put into the camera app since I last used it. Once that was settled, I laid out the leftover foodstuffs and started recording. Starting with the into at my empty chair (not just headless), I then showed the entree (baked talapia) and veggies (corn (maize)), then to my desert (lemon bar), and finished showing my beverage (diet Coke). I reckon it went ok.
My wife prepared the meal, at her lunchtime. I worked about 8am – 3:20pm today, and she was busy with her piano teaching when I arrived. After some time relaxing and swimming in the pool (still warm enough! ), I was ready to eat. Posted the video, but noticed that the http://tdc.ds106.us webpage is not picking up the videos. However, knowing that YouTube is persnickety, I also found I could not find my own video by searching for tdc633. I tweeted the direct link, and that works. And this blog entry might work also. I did update my tags, as it seemed that “dailycreate tdc633 was all one tag; I changed it to two. But I know that YouTube doesn’t really work on the tag system, so I have both tags in my title. Exploring the technology is fun and useful. I need to get back to working on the story part! And here is a late edition from earlier. A few days ago I made brownies for my wife for use with her piano students. I took the opportunity then to snap pix of the eggs. 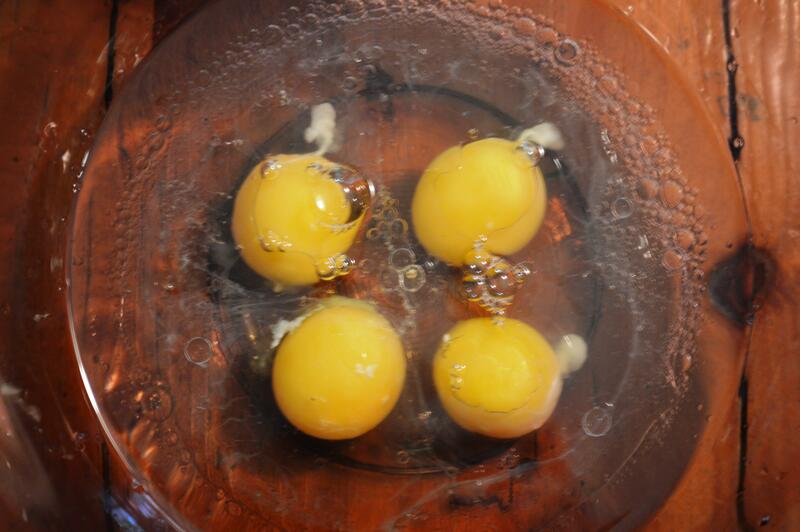 So, here are four chicken eggs, up close. The Daily Create 631: List twenty ways you can document your learning. How many have you done this week? I’ve been pleased at the resonses from so many people. The lists have several common ideas, and many that are unique and personal. Read them yourself at http://tdc.ds106.us/tdc631/. This morning, I was most intrigued by Seth Goodman’s reply. See his blogging at http://netnographyandthehood.com/2013/10/01/documenting-learning/. Now, I don’t know Seth, though I vaguely recall some references to him. Apparently he was active in ds106 and has taken a break during the time I have become involved. 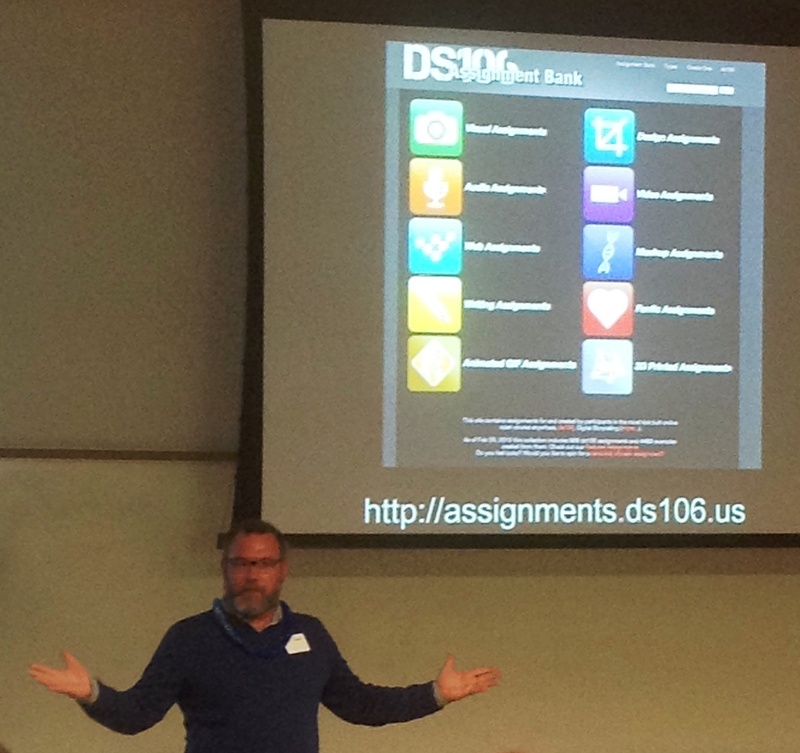 Now he is re-entering the stream, with thinking about how to document learning. In Seth’s blogpost, he mentions how he first thought this was a simple, even boring, assignment. But then, “I began to reflect a little. And I found that I couldn’t quite get my pointy head around it.” This seems to be the turning point, the aha! moment of creativity. And the point at which he began to realize that “learning” is something that can be quite slippery to define. How can we document something if we don’t know what it is? repetition: The ability to repeat what is learned may be a good indicator that learning has occured. This is the change in behavior that defines learning in Skinner’s “operant conditioning” model. This is often what we test in a formal school setting; can a student repeat in some form the details they studied? ask for help / resist the temptation to ask for help: These contradictory thoughts work together. In forming a good question to seek help, one must have learned the topic up to a particular point. There is some confusion or incompleteness that needs to be resolved. But, there may still be some reasoning, practice, adjustment, etc that one could make to coax the answer into existance. Both asking and working through are valuable in creating learning, and in documenting the learning. A well-formed question may be more important than the answer. abandoning it in public / make it to be given away as a gift / sharing it with friends and family: These responses are similar with subtle differences. I really like the idea of abandoning. To put something behind us so totally that even the documentation, the artifacts, are no longer with us could mean that we are moving on, or moving in a different direction, or simply have no need to travel that road any longer. But in making a gift or sharing we are deliberately involving others in our learning. Whether strangers, friends, or family, the sharing is somewhat different, and the feedback (if any) is received with different mindsets and emotional responses. OK, I’m really enjoying typing this up, and tending to ramble in my mind, so let me conclude. 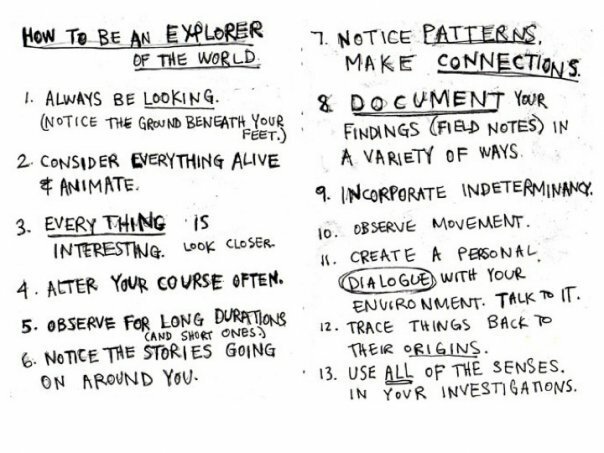 I think what I am finding is that there are many ways to document learning. The documentation also is part of creating the learning. And what we do with it after we are done has influence on how that learning is reinforced, modified, or continued. Thank you, Seth, for re-entering the fray with this topic. You are in turn stimulating my own thinking and learning!